Hello, everyone. My name is Michael, I’m twenty years old, and I have never read Harry Potter. Yep, there it is. Boy, has it been a difficult journey. I’ve been ridiculed mercilessly; one time in second grade the entire class laughed at me while I hid under my teacher’s desk and cried. I WAS EIGHT, OKAY? I’ve been on the outside of jokes, missed endless references, and, maybe worst of all, I had the magical series spoiled for me. Again. And again. And again. I’ve basically gone through life with In the Arms of an Angel by Sarah McLachlan playing at all times. But that ends today. 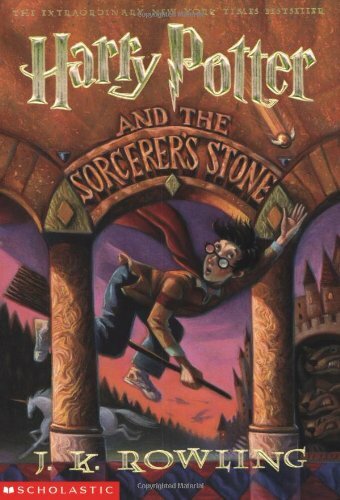 That’s right, I’m finally reading Harry Potter and the Sorcerer’s Stone. And I’m here to write about this journey. Be right back. *throws self into book* In the mean time, enjoy this Harry Potter themed gif. Okay, I’m back. And first I’d like to say, wow, I tweeted about reading this for the first time and my notifications blew up, guys. I felt like a celebrity for a whole two hours there. I’m sad to say, I feel like I definitely missed out on a lot of the magic not having read this as a kid, which is a serious downer. I’m not saying it was bad in any way, just that I missed the part of my life when I would be able to relate to the events that occur in this book. When I was nine or ten, sure, I would have found myself connecting with Harry on so many levels. I’ve had to deal with bullying, annoying classmates, and learning new and exciting life things. But the problem is, I’m not at that point in my life anymore. My current tastes in reading skew darker, older. I have been told that the series takes itself in that direction with each subsequent book, so I guess I should wait to formulate my full opinion until I’ve finished the series. With that said, let’s get to my thoughts on the story. Harry Potter is a wonderful protagonist. He’s this fun, intelligent character who does what he thinks is right no matter what the cost. And the supporting cast is stocked with strong characters, both good and evil (my first thought while reading the book: UGH, these Dursley people are the WORST). The magic is wonderfully concocted (see what I did there) and Hogwarts truly is the perfect setting. I totally want to visit The Wizarding World of Harry Potter now! The book also did a bang-up job in having its own individual story, while also setting up future sequels at large. I wasn’t expecting to get into the thick of things this early on in the series, so I was surprised the stakes got so high toward the end of the novel. Overall, though I couldn’t relate to Harry Potter on a personal level, I could still appreciate it for being such a quick, fun read. Previous ArticleSteven Universe 2x11 Review: "Keeping It Together"